Here is a simple guide on how to set up your iPad to mirror* your display for your class through a projector or HDTV. 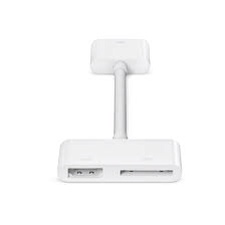 You need to purchase this Apple VGA adaptor, priced at $29 USD at the Apple store. You may be able to find a third party adaptor elsewhere, but my experience with the Apple one has been positive. You also will need a VGA cable (the standard one that most people connect their computers and monitors with). As for sound, you will need a set of speakers (computer speakers, once again, will do the trick). 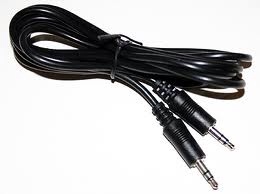 You may need to also purchase an inexpensive 3.5mm male to male audio cable, often available for a few dollars at electronic stores or even dollar stores. That is it! You are now going to able to mirror exactly what is shown on your iPad without any lag at all. More recently released projectors will have hdmi outputs. 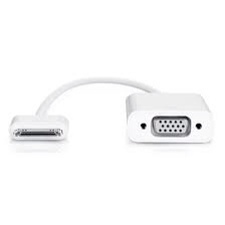 In this situation, you should purchase this iPad hdmi connector ($39 USD). Since this is the setup I have been using, I can say that sound will still require the 3.5 mm male to male audio cable. You will need an hdmi cable to connect the iPad and the projector as well (instead of the VGA). Exactly like the option above, there is absolutely no lag time when mirroring the iPad this way. 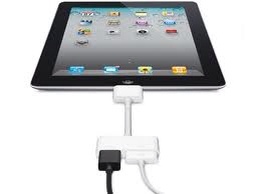 Notice in the image below that you will still be able to simultaneously charge your iPad while using this adaptor. 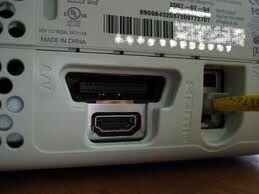 If you happen to have an HDTV, instead of a proector, but not a strong wifi signal, you can simpy connect the hdmi cable from the iPad directly to one of the tv’s hdmi ports. A third and more advanced way advanced way of displaying your iPad through your projector is with an Apple TV. This method will be great if you own a newer projector with HDMI and if you have a strong wifi connection in your classroom. Through Apple’s AirPlay, you will be able to mirror your iPad (and students’ iPods, iPads and iPhones) wirelessly. If you happen to have an HDTV for your classroom, this would be the ideal setup for you. Apple TV in itself also has its benefits besides AirPlay. Check out more about Apple TV In the classroom here. The Apple TV is only $99 USD, making it almost a no-brainer purchase for consumers who own HDTVs at home and at least one iOS device. In terms of lag, depending on your wifi strength, you will notice a very slight delay between the iPad and the projection when comparing to the above two methods. In terms of sound, you will need your projector to be hooked up to stereo speakers. Notice that the Apple TV is not to be confused with the Apple television, rumoured to be released in the near future. I hope some of you will soon be able to connect your iPads with one of the above methods. When I first tried method two at the end of the last school year, I was so excited about the learning possiblities! *mirror = displays exactly what is shown on your iPad, including swiping between apps, home screens etc. Please note that in order to get full mirroring of your iPad, it needs to be an iPad 2 or newer device. 1st generation iPads will not mirror but only have video out.